Enjoy the true essence of girl power here as you fight alongside a band of female fighters in Wild Warriors. This 5 reel, 30 payline Playson slot has a fantasy theme. The game includes; stacked wilds, free spins and higher paying symbols. You can access the game on all desktop, tablet and mobile devices for stakes between 30p to £90 per spin. Playson is an i-Gaming software company that was established in 2012. It's still considered a newcomer in the industry, but that doesn’t mean the company plays small. Playson is expanding quickly, proving that they have the ability and ambition to compete in the online betting business. To date, Playson has employed more than 250 members of staff all over the world and established several business relationships with partners in the industry. These include companies like 1X2 Gaming, Bet Construct, Leander Gaming and Quickfire. Playson not only offers services to land-based casinos but the online gaming market as well. Their games are fully optimised for online gaming with Flash for all your desktop devices and HTML5 for smartphones. The visuals include misty hills in the background and flags fluttering in the back paired with amazing slot bonuses. You’ll spot lower value symbols spinning around the reels as well as a panther and 4 warrior women wielding ancient weaponry such as swords, spears, daggers and crossbows. The imagery in the slot has a comic feel to it and works well. The best paying among the 4 warriors is the blonde who pays up to 1.6x your coin bet per line. Wild symbol -The Wild Warriors logo acts as the wild symbol. It can land on all the 5 reels and spin as a fully stacked formation. Hit 5 wilds and you’ll win a payout of 33.33x your total bet. Scatter symbol -The round shield acts as the game’s scatter symbol. It can land on the 3 reels at the middle only. Land 7, 8 or 9 scatters on one spin and you’ll win a payout that’s twice your total bet as well as activate the Free Spins feature. You can play 8, 12 or 25 free spins. 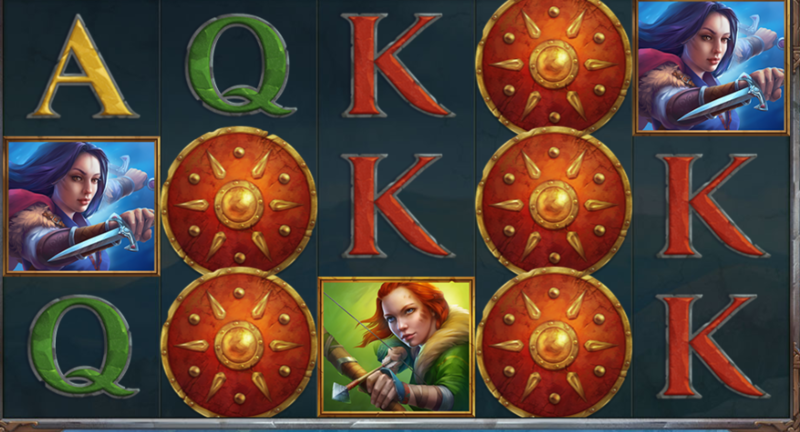 Free spins feature -When the free spins start, you'll see the 4 Lady Warriors appear as Colossal Symbols. These symbols can spin as 2×2 or even 3×3 block setup. The payout symbols aren't as large for the standard, even when players land a 5 in a row combo. The Colossal 2×2 and 3×3 blocks in the feature give you a chance to win some big combinations. Wild Warriors has a medium to high variance with the highest possible wins going a little over 670x your stake. It's got a simple appeal to it, but the sword and sorcery adventure is simple and highly enjoyable. The design is also well done and the Free Spins feature provides a lot of potential. Your luckiest bet would be to land several Colossal symbols and Wild Warriors because that's bound to deliver some very wild action. To play Wild Warriors, visit the site.